Moving into its third year, the WAN Metal in Architecture Award 2016 recognises the increasingly high standards that are being achieved within metal design and construction. This Award celebrates the use of this material across the whole spectrum, from Aluminium, Steel, Lead, Tin, Zinc, Copper and Nickel. A long list of 31 projects were evaluated by a panel of industry experts who used their experience within this sector. To reach their verdict, factors such as originality, innovation, form, function, sustainability and context were considered. Representing this sector we were honoured to have on this year’s panel: Justin Laskin, Associate Partner at Pollard Thomas Edwards, Martin Henn, Partner at HENN, George Keliris, Director of Structures at BuroHappold Engineering and Bart Reuser, Founding Partner at NEXT Architects. 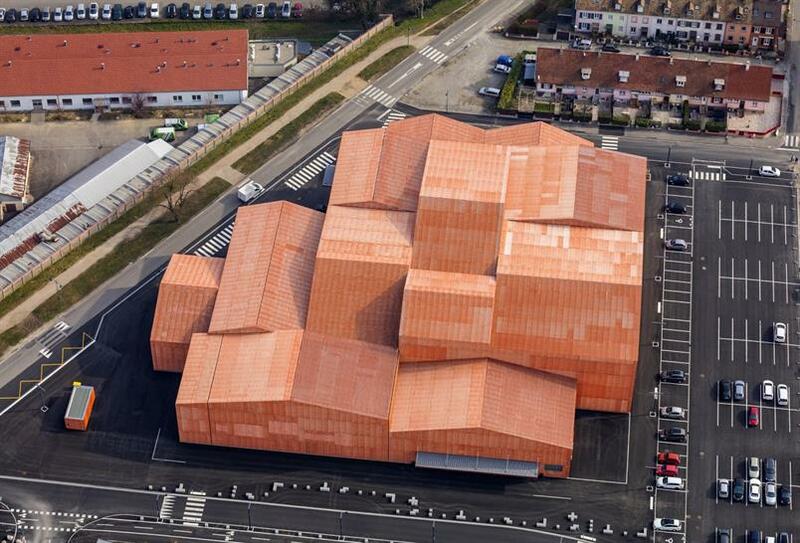 The FORUM Associative is an events and sports facility located in Saint-Louis, France. 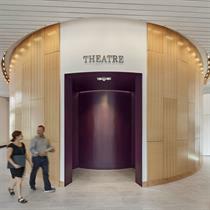 Designed like a puzzle, each space fits into the continuity of the next one, allowing a fluid circulation and rapid flow between the functions, where no corridor or galleries are needed. The main challenge of this project was to ensure that those spaces had the possibility to communicate in a more or less direct way, according to the program of the moment. The spaces all fit together uniquely due to all being covered with the same principles of forms, materials and openings. The roof volume is systematically made up of two slopes, inspired by the design of the roofs in the area, Martin applauded the simplicity of this stating: “The combination of metal and a pitched roof building is surprising and interesting. The cell-like aggregation and the reduced appearance create a highly abstract impression.” The project is made up of several distinct volumes, linked up to one another in a way the smaller volumes are placed at the edge of the individual houses, and the more imposing ones placed at the centre. On Noor Island, a lagoon island in the middle of the capital of the Arab Emirate Sharjah, design studio 3deluxe is currently designing a 2.5 ha transmedia Landscape Park, interwoven with an ensemble of several themed pavilions and buildings. 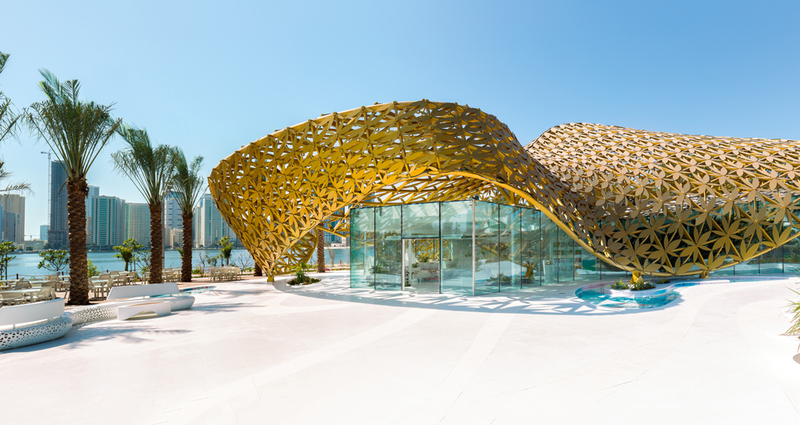 The most striking building on Noor Island is Butterfly Pavilion, whose ornamental shading roof characterizes the island. It houses more than 500 butterflies in a unique biosphere and offers visitors numerous opportunities for both contemplation and recreation. The design of the Butterfly Pavilion, is realises its design principle of multi-layered atmospheres: in material and mood layers, natural and artificial levels which blend into a visually and emotionally condensed overall picture. Located on a steep hillside in a pine forest, the Micro-Cabins in Leadville, Colorado, were designed as micro dormitories for the Colorado Outward Bound School. 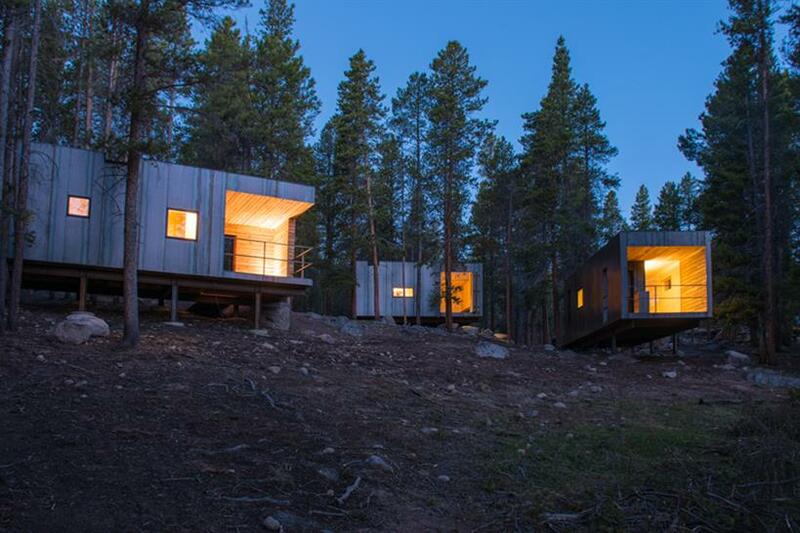 The cabins rest on the landscape, elevated above the winter snow pack on steel columns. The client brief called for 21 cabins, seven senior staff insulated cabins for year-round use and 14 un-insulated cabins to meet the housing needs during peak season. In 2015, a group of 28 students undertook the 14 un-insulated cabins. 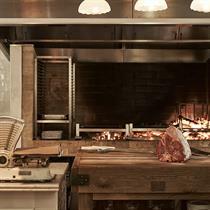 They were conceived as two simple elements: a "box" and a "frame." 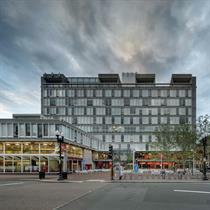 The frame, consisting of three structural steel bays, handles both the gravity and lateral loads of the building. 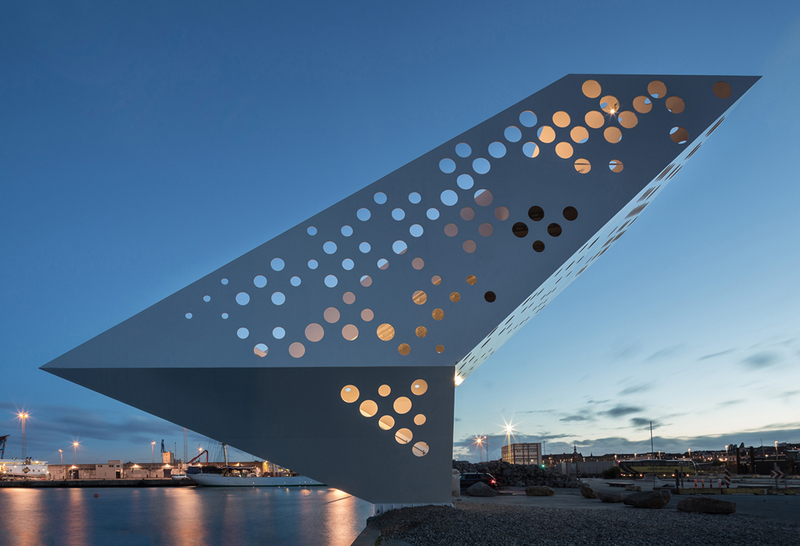 The viewing tower and landmark on the harbour of Aarhus Ø, Denmark, Salling Tower is shaped as a dramatic urban sculpture with a significant architectural expression. 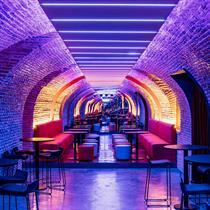 The white body of steel is a luminous and distinctive focal point and meeting place. The route through the tower leads under an inclined surface and up to the first viewing plateau that hovers above the water. From here, the visitor is led upwards by a broad staircase which serves a lookout to panoramic views of the harbour and bay. 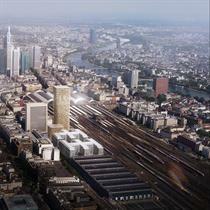 The upper plateau serves 360 degree views of both the city and harbour. The Castle Downs Park Pavilion located in Edmonton Alberta, Canada unifies a wide range of outdoor recreational facilities within a suburban park, and helps instil them with a sense of place. As an organizing device along an east-west axis, the low-slung linear pavilion responds to the prairie landscape and gives definition to a vast, flat site. 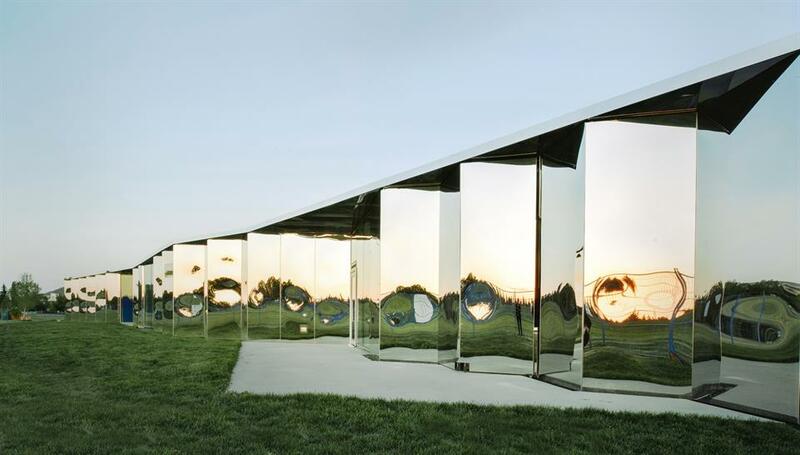 Faceting and inflection characterize the form of the punctuated bar - a mirrored pavilion that offers broken and distorted reflections of its immediate environment. As an object in the landscape, the pavilion has an important function in connecting the various sports fields directly to its north and south. 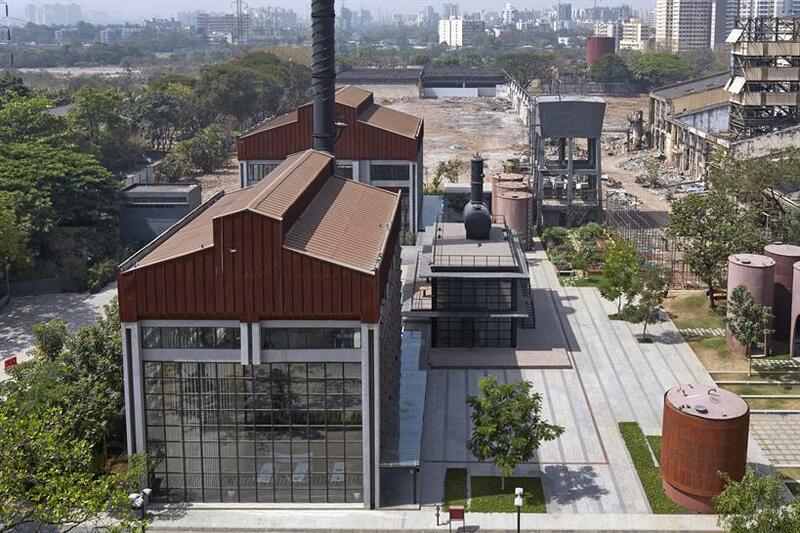 Located in Mumbai, India the Imagine Studio is a response to the heritage of one of India’s biggest industrial houses ‘Godrej’, a family owned business that started making locks in 1897. We would like to congratulate all of those who were shortlisted and to thank all who entered, along with our judges for 2016. The overall winner will be announced on September 20.